This film won't lose any of it's entertainment value on the small screen, but the visual effects and space footage are so awe-inspiring that the more theatrical the experience, the better. But as luck would have it, Eastwood also got the nod to direct "Space Cowboys," and that makes all the difference in the world. Sure it's an entirely predictable story, with right-on-cue arrivals of the round-up-the-old-crew scenes, the I'm-too-old-for-this-s**t training episodes and the "put a sock in it, sonny" showdown with a cocky young shuttle crew. But Eastwood proves once again what a monstrously good director he is by turning this design-by-committee summer blockbuster into an endlessly entertaining outer space rescue mission. And he does it old-school, without a single musical montage sequence or MTV-edited action sequence. 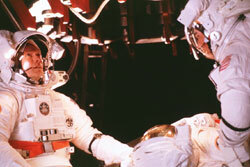 "Space Cowboys" may be pure popcorn, but stylistically it's more "2001" than it is "Armageddon." And -- hold on to your hats -- it has even better special effects than either of those pictures. The plot is elementary stuff without surprises: A dangerous Russian satellite, with an antiquated navigation system based on stolen SkyLab specs, is 30 days away from a malfunction that only retired space propulsion designer Frank Corvin (Eastwood) knows how to prevent. NASA's choices: Acquiesce to Frank's demand that his old team all fly the mission or face the possibility of nuclear annihilation. Yep, you guessed it, the satellite is a cold war launching pad -- something the crew isn't told until they're already in orbit. Now you see how bad this movie could be, don't you? But trust Clint Eastwood. He has a lot of experience directing boffo films from utterly conventional scripts, be it a Western ("Unforgiven"), a sudsy romance ("The Bridges of Madison County"), a wrongly-convicted death row rescue ("True Crime") or an outer space action movie. One of Eastwood's directorial trademarks is that he takes his time in telling stories. A good third of this movie is spent on the training of these over-ripe fly boys, yet there's not a narrative lull in the entire picture -- thanks mostly to Eastwood's endlessly self-abasing sense of humor and the cast's thoroughly enjoyable performances as weathered wise-crackers. Eastwood sticks with his standard leather-and-charm persona as the team leader, a former spacecraft engineer who has trouble even assembling a new garage door opener in an early scene. Jones is just the right choice as the hot shot pilot who bugged off to the country and became a daredevil crop duster. Sutherland is a roller coaster engineer and fancies himself a ladies' man, but has a bad habit of playing with his dentures. Garner became a preacher, but he's not very good at it, so the chance to go play at NASA appeals to him instantly. As a director, Eastwood doesn't use the grandpa routine as a crutch. The story, obvious as it is, stays tight -- even if it does get a bit corny when Jones starts romancing the mission director (Marcia Gay Harden) and becomes downright sappy when it's discovered one of the four leads has inoperable cancer (I smell a heroic sacrifice coming on!). "Space Cowboys" is also a visual feast full of absolutely astounding special effects: Breathtaking launch footage, gorgeous Earth-from-orbit shots during authentic-looking space walks, and a burning-up re-entry scene with the shuttle's heat tiles glowing such an intense hue of incandescent orange you won't be able to let go the arms of your theater seat until they safely touch down -- in, of course, a miracle landing during a systems failure. Who'd have imagined the summer's best effects-driven event movie would star 70-year-old men and not feature a single hit single in heavy Top 40 rotation? But guess what? Here it is.